Certificates with an expiration date between the December 1st 2016 and 1st of January 2016, which were signed using SHA-1 or holds an SHA-1 intermediate certificate, will be classified as “secure, but with minor errors”. This status will be displayed visually, using a small yellow triangle as a warning. Certificates with an expiration date between the 1st of June 2016 and 31st of December 2016 (inclusive), which were signed using SHA-1 or holds an SHA-1 intermediate certificate, will be classified as “secure, but with minor errors”. This status will be displayed visually using a small yellow triangle as a warning. 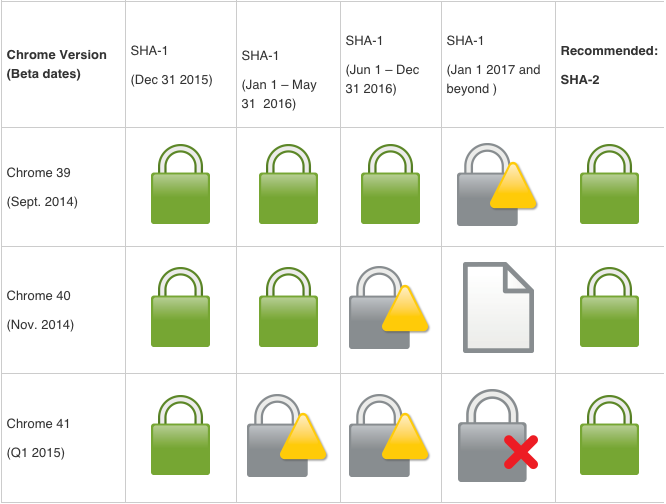 Certificates expiring on or after the 1st of January 2017, or contain an intermediate certificate which was signed using SHA-1, will be treated as “neutral, lacking security”. This status will be displayed using a blank page icon. Certificates with an expiration date between the 1st of January 2016 and 31st of December 2016 (inclusive), which were signed using SHA-1 or holds an SHA-1 intermediate certificate, will be classified as “secure, but with minor errors”. This status is going to be displayed visually using a small yellow triangle as a warning. Certificates expiring on or after the 1st of January 2017, which were signed using SHA-1 or contain an SHA-1 intermediate certificate, will be classified as “affirmatively insecure”. This status will be displayed visually using a lock with a red X, and a red strike-through text treatment in the URL scheme. Connectivity issues will arise, i.e; content may not load and display properly.